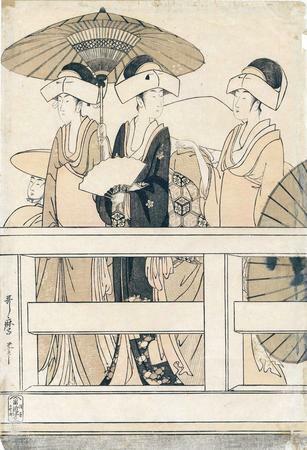 Laurence Binyon wrote in Japanese Colour Prints in 1906 on page 128 about the full composition by Utamaro: "In his unique six-sheet composition of "The Bridge" the figures are tall and slender, but with no wasp-like contractions. There is only one other instance known of a six-sheet composition formed of two triptychs placed, not side by side, but one above the other, and that is a view of a theatre interior, and the audience, by Toyokuni." "A scene of women enjoying the cool by the Sumida River in summer on top of and beneath Ryōgoku Bridge. The view is facing downstream, past the pillars of the bridge, with the Bukufu boat-houses on the left bank in the background and Shin'ōhashi Bridge in the far distance. To pair triptychs on top and below in this manner is unprecedented, creating an unusually large composition. The figures on top of the bridge look to be a group of three maids from a samurai mansion, wearing head-cloths (age-boshi), and mothers and children. Beneath the bridge covered pleasure-boats (yane-bune) and fast ferries (choki-bune jostle their prows. Common features of Ukiyo-e prints in general demonstrated here are the almost exclusive depiction of women and also the composition of each sheet so as to be worthy of individual appreciation." The center and right panel of the original triptych - of which the print in the Lyon Collection is the left panel - are in the collection of the Museum of Fine Arts in Boston. They also have the entire bottom three prints, in generally good condition, with good color. The top three panels, including this one, are illustrated in black and white in A History of Japanese Colour-Prints by W. von Seidlitz. The top three panels of this composition can be found in the Worcester Art Museum.